The big guns, gender-neutrally speaking, were all out at the recent DCCC Women’s Power Lunch in San Francisco: former (and this crowd hopes future) Speaker of the House Nancy Pelosi, an assortment of other House members including Congresswomen Barbara Lee and Jackie Speier, honoree Nan Tucker McEvoy and most of everyone who is anyone progressive in Northern California. But MC Gloria Steinem, 78 and proud of it (and looking pretty darned good to this 79-year-old) was still the star. Steinem spoke with characteristic vigor about women’s rights currently very much in jeopardy, suggesting that many of the country’s economic issues could be solved simply by raising women’s pay to the level of men’s, and that fixing other inequities wouldn’t be a bad idea either. She also homed in on the Republican pledge to overturn both Obamacare and Roe v Wade. 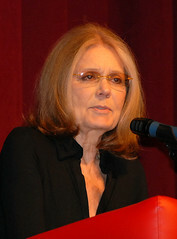 If a constitutional amendment were passed declaring the fertilized egg a “person” with full rights, Steinem said, women would not only lose their own rights but face serious endangerment. Such as: a pregnant woman thought to be inclined toward trying to abort could be physically restrained through the remainder of her pregnancy. d not,” she said, and working to protect the lives of our daughters and granddaughters. I feel certain that my gentle, righteous mother would not have supported for a moment my being forced to continue an unplanned pregnancy and bring an unwanted child into the world. I hope, partly through my support for women’s rights, my granddaughters will have the right to make their own safe choices. During the late 60s and early 70s, I advocated heavily for women’s rights…particularly with equal pay for equal work. Gloria Steinem had just launched her magazine and we all looked up to her. During those days, I was the leader of a movement at a very large SF corporation to get women promoted into positions normally filled by men with the exact same qualifications. The mentality of these senior executives continued until they had daughters they sent to universities who upon graduation were not able to get these “man-jobs”. Only then did they understand what we were trying to promote! I have watched the evolution of the women’s movement over the years and have been startled by the recent election and all the comments made by the conservative right. It disturbs me greatly that this mentality still exists in this day and age. Glad you wrote about this. Wish I had been there! I was in the job market about 10 years too early (10 years pre-Steinem, that is.) It’s the memory of those days when women had virtually no power and no rights in the workplace, and the similarity with what’s happening today especially in the area of reproductive rights, that keeps me agitating for women’s rights. And keeps me grateful for people like Gloria Steinem.